This imposing v-twin was built at the Wolverhampton AJS Factory in 1929 with the aim of raising the motorcycle world speed record to 150mph. Its alcohol-fuelled 990cc power plant has cylinders at a 50-degree angle and chain driven overhead camshafts of this type seen on the company's single cylinder racers. After a try-out by AJS works rider George Rowley on the Wolverhampton to Bridgenorth road, the feisty twin was run-in at up to 130mph by records rider Oliver Baldwin at the Brooklands track. In August 1930, Baldwin entered the AJS in a records meeting at Arpjon south of Paris, but suffered piston failure. BMW then hoisted the target record to 137.58mph and financial difficulties prevented AJS from responding. During 1931, the Collier Brothers took over AJS. 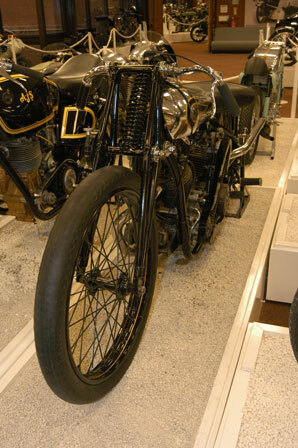 The v-twin was taken to their Matchless factory in London where it was fitted with a supercharger and bronze blown AJS on Southport Sands in Lancashire in May 1933. A crowd of 20,000 looked on but Wright only managed 136mph in an attempt delayed by the late arrival of international timekeepers. A few months later, he wound the AJS up to a creditable 145mph in Hungary butfell short of the 151.77mph set by BMW in the previous year. The machine passed into private hands and was shipped to Tasmania in 1939, where local rider Reg Munroe took an Australina record on it at 119.9mph. In the Eighties, the AJS returned to the UK and was restored by Geoffrey St John. He surmised that unsufficient fuel tank venting had caused starvation that prevented the v-twin from realising its true potential.